Thos. 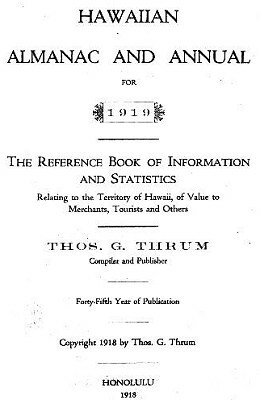 G. Thrum : Hawaiian Almanac and Annual for 1919. Page 64 HANA OF HISTORIC TRADITION AND ROMANCE. The south-eaatern division of the island of Kaui, comprising the districts of Hana, Kipahulu, Kaupo and Kahikinui, must have been at one time a central point of kingly and priestly power, and held strong attractions which drew from across the Hawaii channel so many attempts of envious aliis to invade its shores, subdue its people and possess their lands. In this and other respects it is a section especially rich in historic traditions, in not a few of which are interwoven legendary tales of romance. Here too centers some of the characteristic popular myths of the Hawaiian race which hark back to their primitive days. Hana is also famed as possessing, at times, strong surfing attraction, the indulgence of which sport developed such skill in its devotees as to invite the challenge of other locality experts. Several such contests are woven into some of the most popular of Hawaiian legends. In the story of Laieikawai it is said that Aiwohikupua, on his way from. Kauai to Hawaii touched at Hana during a surf-riding contest in which the chiefesg of the district was the center of attraction, and was his excuse for considerahle delay that he might participate in the sport with so charming and prominent a competitor which resulted in an entanglement that hampered him ever after for his perfidy. Kiha-a-Piilani, visiting Hana incognito, was another who lost his heart to a charming contestant in surf-riding indulgences of some four days duration off Pueokahi, when Koleanioku, daughter of the high chief Hoolae, at the close of the contest betrothed herself to the Waikiki expert, and in taking him "for better or worse" without seeking paternal consent she was disowned and disinherited. But when Kiha's incognito period wore away and the designing parent- and daughter learned that - all unsuspecting- she had chosen the very one she had been pledged to, the chief relented, it is said, and all was forgiven if not forgotten. Public opinion is aroused from time to time at the lessening area available to them of this much-heralded Houolulu attraction, and demands are made that private interests should not bar free-access to the sand beach, bathing and surf-riding facilities of Waikiki. The matter is again agitated from both local and tourist standpoints, and is in the hands of a strong committee to devise the way and means of acquiring rights to a large section of beach property to be thrown open to the general public, that the famed recreative attraction prove Honolulu's worthy asset. Sunday Advertiser, Issued every Sunday morning by the Hawaiian Gazette Co,. Ltd. The Dally Pacific Commercial Advertiser, Issued by the Hawaiian Gazette Co. every morning (except Sunday). The Honolulu Star-Bulletin, Issued every evening (except Sundays), by the Honolulu Star-Bulletin. Ltd.
K, A. McNally. Editor, Semi-weekly Issued on Mondays and Thursdays. 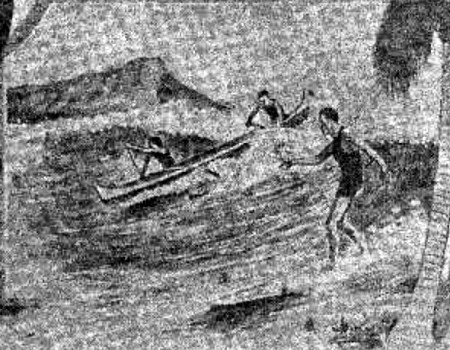 Surf Riding at Waikiki, 1919. Geoff Cater (2013) : Thos. 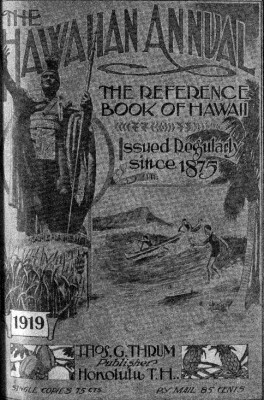 G. Thrum : Hawaiian Almanac and Annual, 1919.